Most fatalities due to defects in buildings occur from people dying in their own houses. These regulations do little to address this issue as single dwellings are exempt, not from compliance of course, but from inspection or certification. Long after the debate about these new Building Control Regulations has ended, we will continue to wake up to stories of families dieing in their own homes. The report accompanying the draft Regulations, in its overview of current practices, fails to explain how Fire Certificates are already issued by local Fire Authorities, who certify that submitted designs comply with Part B of the building regulations. The Architect or Fire Consultant in his or her submission has to demonstrate that the design complies with Part B of the building regulations, but relies on the Fire Authority to certify and approve the design. Before a final Certificate is issued, the Fire Authority frequently inspects the building to ensure all visible elements of the design have been correctly installed. This is an existing form of public regulated certification that is in place and works to a large extent. Buildings are regularly inspected by the dreaded Fire Officer and their involvement ensures Fire Regulations are mostly adhered to in all non domestic buildings. No mention is made of how this current system actually operates or could be improved to avoid the rare instances where the fire certification system has failed. These regulations are obviously a reaction to the Priory Hall fiasco. A Fire Certificate was presumably applied for and obtained for Priory Hall possibly even with some inspection by the Fire Officer but this did not mean that the building was not seriously defective in some fashion that was not visible. The Architects Certificate obviously only certified the design and the visible elements of the construction. These revised regulations seek to make the architect or whoever certifies the building responsible for all defects, including invisible defects and defects that have yet to occur. The thinking here, no doubt, is that long after the developer and contractor have ceased to exist as legal entities, the architects insurance will pay for the remedial works and the problem will go away. No architect will sign these certificates. No insurance company would provide such insurance anyway no matter what the premium. Even if the architect was insured and signed a certificate, if after two years the architect no longer had insurance as he retired, applied for a paye job or went out of business, the insurance aspect of the certificate would be worthless. Architects do not insure projects, they insure themselves against claims for the annual duration of the insurance only. On a lot of jobs the architect has little direct control over quality. The only sanction the architect might have is in refusing to certify monies to a contractor. Where the contractor and the developer are the same person or company, as is often the case with speculative development or in the case of government favoured design build contracts this sanction does not exist as the role of the architect is reduced to that of a design consultant outside the main construction contract. If an architect cannot supervise the works and has no power to sanction the contractor for breaches of regulations, how can an architect sign a certificate saying the works are free from defects? It’s like asking a doctor to to sign a certificate saying a patient is free of cancer. The report, in an attempt to make the new certification system seem plausible, mentions a new code of conduct for inspections that will be published at some stage before the regulations are enacted. Without the benefit of being able to examine this proposed code, it is hard to assesses in overall terms the viability of the new system for certification. If the code limits inspection to visible items it will not address the issue of concealed defects and if it suggests that every element to be inspected prior to concealment it would require a role similar to that currently provided by a clerk or works who is permanently on site, a role that no architect provides except on the largest of jobs funded by the wealthiest of clients. Neither the report nor the Regulations make any attempt to regulate contractors, register them, make them answerable to building control or provide their own certification for what they have built. Builders are the last unregulated link in the chain of building. No amount of reliance on the goodwill of architects will change this glaring and obvious defect. Where is an industry wide insurance system to collect bonds and use them to remedy builders defects? Homebond, the only existing arrangement of this nature, has effectively abandoned owners of houses with defects. Regulating contractors might be beyond the scope of these regulations and require additional legislation, but that is no reason to make these regulations unworkable as an interim measure. Most defects are probably as much to do with ignorance and indifference as greed or malice. Contractors should have state approved qualifications and not have to rely on nanny architects telling them how to build. In my role as a BER certifier I am required by SEAI to do exams every two years just to prove my relevant knowledge is up to date. How often does the state insist that contractors are tested on their knowledge of the building regulations ? 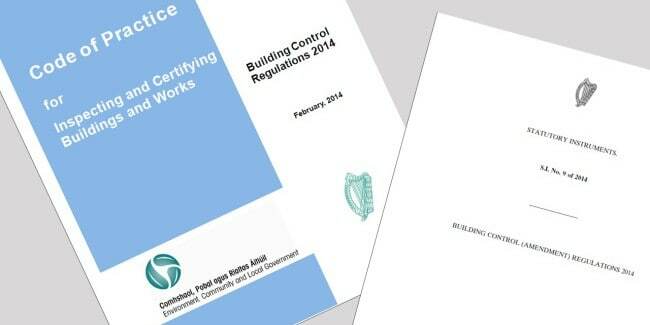 The report on the Regulations states that to date, Ireland has had a very active state wide inspection system, with supposedly up to 25% of non dwellings being inspected. Presuming that this is not a printing error or some form of mistake, it can only be arrived at by a very selective presentation of facts. I have never heard of a building being inspected by anyone other than a Fire Officer. I suspect that the fire authorities’ figures were used to inflate this claim or it only applies to the very low volume of buildings constructed after 2009. If contractors knew that their site was going to be stopped because the structure, sound, plumbing, ventilation or energy measures etc were not in accordance with regulations then they would have to be much more careful. A stopped site is an expensive site. How has the Health & Safety Authority improved site safety ? Was it by relying on Architects inspections and insurance ? As is often repeated when discussing building standards, an ounce of inspection is worth a ton of regulation. The Revenue Commissioners run a system of voluntary declarations followed up with random audits. Inspection by independent bodies with statutory sanctions is the the most effective way of ensuring compliance. It is not acceptable anymore for the local authorities to state that they cannot afford to do inspections. They used to do successfully do inspections under the old bye-law system. Why not rationalise the local authorities and their roles or if necessary subcontract their role to the private sector. Developers and owners could pay commencement fees commensurate with the size of their project. The Architect can arrange for contract drawings and specifications to be lodged at commencement stage and again at completion stage, preferably to a nationwide standard and not the current practice of each county having its own standards and requirements. The easiest way to fix a problem is to avoid it. The new regulations should be aimed at defect avoidance rather than defect resolution. Regulations aimed at creating paper certificates and insurance without any meaningful independent enforcement are just a can kicking measure that will do little to improve actual construction standards. Meanwhile, many people will continue to die in their own homes and others to work and live in substandard multi unit buildings. A paper trail is not the same as a building that complies with building regulations, and let us not forget that the building regulations are the minimum standard required. Where is the encouragement or aspiration to provide something better than the minimum? Even if the mandatory certification and insurance were supplied by the contractor, the most significant player in the construction team, the end result might be no less problematic than the current system of self regulation. Imagine if the Food Safety Authority adopted a similar proposal, abandoned inspections of restaurants by its officials and required all head chefs to have insurance, even though they were only employees of the restaurant owner. The cook would have to publicly display a certificate stating all the restaurant’s food was free from any defects. If there was an outbreak of salmonella, the cook’s insurance could be relied on to pay for hospitalisation costs of sick customers and compensation to families of dead customers. Never mind that the cook, as an employee, might not be responsible for the poor condition of the restaurant facilities or the substandard quality of the supplier’s ingredients. No doubt the rational behind requiring mandatory insurance to cover any defects in the food is that it would make cooks more careful and somebody accountable. They would have to inspect their food suppliers on a regular basis, but how often would be the question? The answer to this could be issued by the Food Safety Authorities in Guidelines for Cooks’ Inspections. I think this analogy goes some way to illustrate my point. I hope my observations are not too late to encourage a radical rethinking of the Department’s proposals, for they are surely needed. I am not just making these comments as an Architect with fifteen years experience who is eager to protect his profession from unworkable regulations, worthy a cause as that is. My wish is to be part of an industry that delivers a safe and healthy built environment. No one person or professional can be responsible for this and I look forward to new regulations that ensure that all participants are truly accountable for their own actions. Bad cases do not make for good laws. Even a good law is not workable if there are no immediate independent sanctions against those who breach them.